Ever since she first saw the preview, probably in August, my wife was excited about the Muppet Movie. She was so excited, in fact, that I heard about it every time we went to the movies as I was forced to take her picture with Muppet posters and displays advertising its premier. She couldn't wait to see it. Well, turns out, my friend Ryan was just as geeky about the film. They made plans to drag me along as soon as it came out. Well, when it finally came out, we all went and saw it... the day after Thanksgiving. I settled in with my popcorn between my two best friends and prepared myself for the worst. Needless to say, I had low expectations. But about 15 minutes into the movie I realized that I was watching a masterpiece. No kidding! It was a great film with a ton of great cameo appearances. I'd mention some names, but I don't wanna give anything away. You've just got to see it. Just when I thought that there was finally a movie with some innocence, Fox News alerted us all to the hidden, even subliminal, sinister message of the film. Leave it to Fox News to scrutinize the Muppets for being too liberal. I know that for some of you the following video is "sooo 72 hours ago," since everyone seems to be Facebooking and Blogging about it. But nevertheless, I can't help but make at least a few comments of my own. Now, the general consensus among the sane is that Fox News is just being silly here. They've become so sensitive to class warfare, as perhaps we should, but their direction is definitely in favor of the rich... in defense of poor defenseless corporate America. Really?! Tex Richman is the American Dream? Taking advantage of people, acting upon impulses of greed and opportunism is the American dream? I mean, did they even watch the movie? Somehow the Fox commentators found a way to make Caroline Heldman, who spoke from sheer common sense and contextual awareness, sound like she was speaking non-sense. That is, after all, the magic of the media. Now, I don't want to harp on this too much. If you agree with Fox News on this one, there's probably no changing your mind... I certainly can't relate to you. But I do want to point out something here... however Fox News and its constituents might try, they can't blame liberals in Hollywood for the voices which speak out against corporate consumption, unfair distribution of wealth, greed in the market, and opportunism of the wealthy over the poor--what they've broad-stroked as "class warfare." It's much much older than that. Indeed it goes back centuries before the United States was ever a thought in the minds of disillusioned Englishmen. It also comes from all corners of the globe, not just from a city in Southern California. For example, you can't blame Hollywood for "A Christmas Carol." Of course Hollywood makes movies based on the story, seems like every year, but that one's on the shoulders of Chuck Dickens, the 19th century English novelist. Have you read that one lately? The villain, like Tex Richman, is a corporate glutton whose own business ventures weigh more heavily in his priorities than the plight of his fellow human beings... or Muppets. In reference to the poor, or "idle people" as he calls them, Ebenezer Scrooge, Dickens' Christmas villain, is quoted for saying, "If they would rather die... they had better do it, and decrease the surplus population!" I think that surpasses even The Muppets' lack of subtlety in their character development. This villain only becomes a hero when he sets aside his selfishness and joins the side of the ones of who he used to take advantage. How about the story of Robin Hood? Or Aladdin? What about Moses vs. Pharaoh in the Exodus narrative? Hell, how about the majority of the Old Testament? And who could forget the New Testament? Maybe Jesus' mother was trying to brainwash our kids with socialism when she said, "He (God) has brought down rulers from their thrones but has lifted up the humble. He has filled the hungry with good things but has sent the rich away empty" (Luke 1:52, 53). Maybe Jesus was teaching class warfare when he mentioned how difficult it would be for the rich to enter the Kingdom. The truth is, in the Bible, God does choose sides. As Karl Barth said, "God always places himself unconditionally and passionately on the side of the poorest and only on that side..." God is on the side of the poor. This is not just a pithy statement but an economic and political reality. The beauty is, God shows no favoritism! God invites everyone, from every gender, race, social status, ethnic identity, etc. to join on the side of the poor. Whether it is 99% or 1%, God sides and shares identity with the "least of these" (read all of Matthew 25... another hefty dose of liberal propaganda from the mouth of Jesus). By selling a narrative in which speaking out against the wealthy is unacceptable, even if the wealthy gained their status through greed and coercion, the staunchly conservative are protecting the status-quo because, obviously, they're benefiting from it. It's a distraction from reality. Isn't generosity, compassion, and community as opposed to personal power a responsible message for us to be teaching our kids? There's a reason that every villain in just about every decent narrative is a greedy, self-seeking, wealthy, and powerful person. It's because when we step out of our idealism and convoluted political perspectives, the exploitation of power over others is obviously wrong. This is common sense if there is is such a thing. Tony Campolo said, "there's nothing wrong with making a lot of money, there's something wrong with keeping it." It's not that the rich are bad. The problem isn't that people get wealthy, it's that too often they do so through exploitation and manipulation. It's not wealth in general but the process of getting wealthy that should be scrutinized. You can be lovingly and compassionately on the side of the poor and still be wealthy. It's just going to look different than it does for Tex Richman and Ebenezer Scrooge. So I think that Fox News, by their overly sensitive reaction to such an innocent and very common children's film, has exposed their own ideological distractedness from reality. Reality is that the poor are more important than our personal comfort. We are called to love, to live a life of love. This will, without exception, lead us to love those on the under-side of society, something we cannot do if we do not speak out against those and that which crushes them and perpetuates their suffering. Along the same lines, we are called to love one another. We cannot do this if we do not engage in community--seeking to bless one another, to come together, and to help one another. 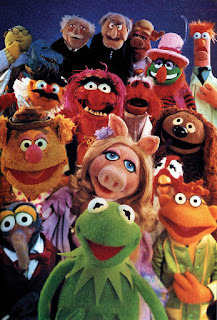 The truth is, the Muppets were on the right track... less can be said for Fox News.